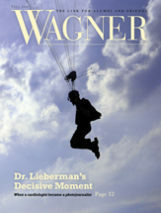 We received reminiscences from several alumni, and also dug up slices of life from old Wagnerians. Plus, find out what books and beer have in common. As if we needed any more proof that beer and books are not incompatible: the Horrmann Library could be said to owe its existence to the frothy favorite of college students everywhere. 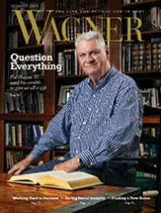 The Horrmann Foundation's $100,000 gift to build Wagner's library was the culmination of a 40-year relationship between the Horrmann family and Wagner College. The story begins with German immigrant businessman August Horrmann Sr., who settled on Staten Island in 1870 and opened a successful brewery that came to be known as Rubsam and Horrmann. It continued to thrive under his children's leadership after his death in 1900. When the Rev. Frederic Sutter, Wagner class of 1894 and longtime trustee, sought to bring the College to Staten Island in 1918, August's eldest son, William, provided key support. William's sister Minnie married Adolph Badenhausen, and that family also became an important Wagner benefactor. 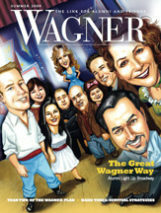 The Horrmanns and the Badenhausens participated in every Wagner fundraising campaign in the early part of the 20th century, contributing to the College's endowment, Guild Hall, and the gymnasium. Family members played key roles on the Board of Trustees, on fundraising committees, and with the School of Nursing. Sadly, Rubsam and Horrmann beer is no more, although it was the only one of several German breweries on Staten Island to survive Prohibition. In 1953, Piels Brothers took it over. It closed for good in 1963. Sources: Wagner College Bulletin, April 1958; and Discovering Staten Island: A 350th Anniversary Commemorative History, co-edited by Kenneth M. Gold and Lori R. Weintrob, Wagner associate professor of history (History Press, 2011). I had the unenviable job of vacuuming the entire library on the third floor of Main Hall. The salary was $20 a week. By the time I finished, I went back to where I had started and realized the dust had returned and the library was back to normal. I clearly remember looking out of the library window as the construction site of the Horrmann Library was underway. There were three huge boulders in the middle of the project that had to be dynamited in order to be removed. I remember the “eccentric” designer who wanted the green cushions on the blue chairs and the blue cushions on the green chairs. 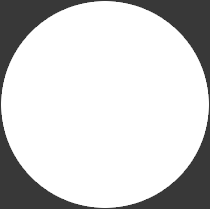 For some time in the early days, the designer would return and make this color change, for everyone else put green with green and blue with blue. We always had fun rearranging them after the designer visit. I remember walking in the front door one time with an ice cream cone and the librarian chiding me with, “You can't bring ice cream in here.” In a precursor of the “attitude” of the later sixties, I recall saying, “You don't have a sign that says that.” I was summarily thrown out of the library! One day I was in the stacks, and a little 12-year-old fellow was looking high (well, as high as he could) and low, when I asked him what he was looking for. He said he wanted to know what the long “Ess” meant in a mathematics book he had. It was the integral sign — the main symbol of half the calculus sequence taught at Wagner. As I was a mathematics major, I sat right down and began to explain it all to him. This was the beginning of my college-level teaching of mathematics, pre-Ph.D. I believe his presence was an example of how open the library was to the community beyond the college. In the fall of 1968, I attended a particularly onerous wrestling practice. Back then Wagner College sponsored the great sport of wrestling under Bill Lied. Bill had wrestled in the Pan American Games, had coached 18 National Wrestling Champions, and had been a referee in the Tokyo Olympics. He knew his stuff and was a tough-love coach. Three hours of practice could be exhausting. There was a physics test the next day and I needed to study. After wrestling practice, I went to the Horrmann Library, where many of us studied while stretching out on the long, blue couches. Getting comfy on a couch with class notes, a yellow pad, and a pencil in hand, I proceeded to review everything that might be on the test. The next thing I knew, I was waking from a deep sleep and all of the lights in the library were out! The library had closed, and it was midnight. Using a librarian's desk phone, I called campus security. They ordered me to stay where I was. They didn't want the alarm set off, which would call NYPD, and nobody wanted that headache. A few minutes later, two security guards unlocked the front door. While facing their high-intensity flashlights, I was asked with even higher intensity, “How did you get in here?” I said, “Well, I never left. The librarian locked me in.” I'm not sure they really believed me, but I presented my student ID and was finally allowed to leave. I passed the next day's test, and many others after that. In June 1969, I graduated from Wagner College with a bachelor's in physics, which started me on a successful 40-year career in design engineering. Maybe I owe it all to the good sleep I had on that long, soft couch in the Horrmann Library? A young butcher journalist, scraggly from a beard he's been trying to grow for two years, fought the Grymes Hill winter wind as he climbed the steps between the Union and North Hall on his way to the Horrmann Library. After finding the set of double doors that open, he proceeded, ID in hand, past the desk librarian, past the quiet rows of tables and print-drenched students, beyond the smirking precipice [sic] of our former President Arthur O., now hanging between the library's two bathrooms, around and down to the lower floor's office door between the books. Through the red curtains in John Auh's office, the office of Horrmann's chief librarian, one can watch the square fill then empty then fill again with students. …The reporter nervously looks around the office for an ashtray. Not finding one, he sticks his hands in his pockets and attempts to divert his attention by reading the book titles on the shelf. Finding this activity to be as equally unsuccessful as the last, he finally turns his eyes toward the square to watch a group of female students pass by. My name is Cliff. I am looking for a girl who will share the same interests as me. They include: quiet evenings in the school library, a nice movie rated PG13, reading Shakespeare books and of course long walks in the park. READ MORE: Our feature story about the Horrmann Library, "Built to Last."